Compared with measures based on claims data, measures that assess receipt of a recommended number of visits with specific psychotherapeutic content for an episode of mental illness would be more strongly linked to evidence. These measures could be developed if information on the delivery of specific psychotherapeutic content (for example, whether psychoeducation was provided or homework was assigned) were documented in medical records, particularly in EHRs that have structured fields or in other electronic data reporting systems. In addition, some therapies can be provided or aided by health information technology (Mohr et al. 2013). Web-based interventions have shown efficacy for a variety of conditions. The interventions may include didactic materials as well as interactive tools that allow individuals to track activities or distress and get feedback on their progress. Therapists have also used web-based programs to support delivering evidence-based treatment (Craske et al. 2009). These programs may be able to track the content and duration of engagement in evidence-based treatment. By incorporating clear details on the content of therapy, these data sources could be useful both for tracking the receipt of evidence-based care and for quality improvement. Low cost if necessary data elements are available electronically. Measures developed from EHR or other health information technologies would allow information on the content of therapy to be extracted more readily. Although EHRs hold promise, adoption of such technology is lagging in mental health treatment settings (Druss and Dimitropoulos 2013), and they often do not contain the necessary fields to capture psychosocial health factors and the specific psychotherapeutic content of visits (Glasgow et al. 2012). Computer algorithms to abstract free text notes in EHRs to identify whether evidence-based psychotherapy was provided have been developed (Shiner et al. 2013); however, these methods have undergone limited testing, and current quality measurement paradigms for EHRs continue to depend on structured fields. Although tracking the duration of use and content viewed in web-based interventions sounds attractive, the feasibility of extracting such information in reliable ways is unclear. Confidentiality. Even when there are no legal impediments to sharing data for quality measurement, current practices for protecting the confidentiality of consumer records limit the feasibility of collecting detailed information on the content of care. Health plans and other entities will need to make special efforts to assure consumers and providers about the confidentiality of mental health or substance abuse records. Additional documentation required from providers. Efforts to capture information on the delivery of evidence-based psychotherapies could be incorporated into medical records, but this would require changes in practice and policy. Because of confidentiality concerns and feasibility issues, prospective reporting in electronic tools (EHR or other systems) would be important to successful implementation. 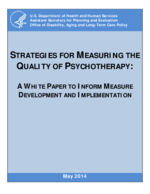 Systematically recording specific therapies or psychotherapeutic content of visits would represent a major change in documentation practice for providers. In organizations where it is common to have limited notes on specific visits, this additional documentation may not be well accepted. Certain forms or tools might alleviate the burden associated with the additional documentation, but this might result in "checkbox" measures that would be easy to implement but might warrant special effort for auditing or review.